All three nominated cows this year are exciting young cows with breed leading genetic indexes, high classifications and milk records, and show ring success….all very worthy candidates! Members are encouraged to submit their vote by June 30th, 2018 by emailing milking.shorthorn@gmail.com or sending in a ballot by mail to the CMSS office at 6A Barrett St, Kensington, PE C0B 1M0. “Star” was the 1st place Two Year Old and Reserve Grand Champion at the 2017 National Show, building on her show success as a heifer, where she was named Reserve Junior Champion at the 2016 National Show. She comes from a successful cow family, as both her dam and maternal grand-dam are past Grand Champions at the Canadian National Show. 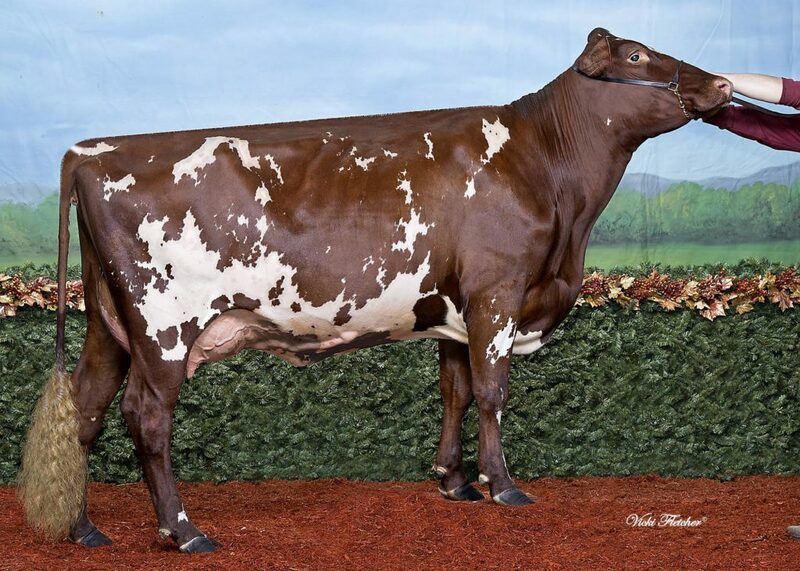 “Star” is close to completing her first lactation with above average milk and components production, and she is the #15 LPI cow in Canada at +2002, with an EBV Conformation of +10. She has a 2017 born daughter by Rovin Bolero-EXP. “Betty” is the #7 LPI cow in Canada at +2154 LPI. She was Grand Champion of the 2015 National Show as a Two Year Old. Currently in third lactation, she scored Excellent in May 2018. In addition to her correct conformation, she was a CMSS Class Leader for Junior Two Year Olds in 2016 and is an above average producer of fat and protein. “Betty” comes from a deep cow family that has been at Oceanbrae Farms for more than thirty years, including her EX-92-3E dam. Her maternal brother (Oceanbrae Royal Bentley) entered the Semex sire lineup in late 2017. “Iceland” has come to notoriety as the the two time Grand Champion at the 2016 and 2017 National Shows. She classified Very Good in first lactation, rescoring 88 points in second lactation. “Iceland” is also the #48 LPI cow in Canada, building a strong index with breed-leading type as well as above average fat and protein production. Her VG-85 dam by POD was bred by Jenna Kippen, descending from the “Irma” cow family from Shady Brae Farms and originally from Ridgeway Irma EX-7E . “Iceland” has been flushed this lactation, with embryos sold within Canada.